Israeli occupation military bulldozers destroyed, on Wednesday, water pipes serving Palestinian citizens of Furush Beit Dajan, to the east of Nablus. Deputy of Head of Furush Beit Dajan Village Council Azem Mohammad said, in a statement, that Israeli occupation bulldozers, accompanied by military vehicles, destroyed water lines serve Palestinian families and their agricultural lands, under the pretext they are illegal. Residents of the area suffer from water scarcity, especially after the drought of Ein Shibli well and other wells e surrounding the village, the Palestinian official said, according to Al Ray Palestinian Media Agency. 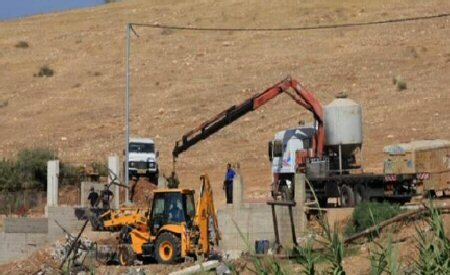 Israeli occupation authorities do not allow Palestinians living in the area drilling of new wells, he added.